Exciting design features in this 4 bedroom, 2.5 bath, residence sitting just above Lake Washington in this quiet Lake Forest Park neighborhood enjoying wonderful views. Light and Bright interiors boast large double pane windows and vaulted ceilings to let in light and Lake Washington views which adds to the spacious feeling this home offers. The formal entry with hardwood floors leads to an elegant living room offering vaulted ceilings with skylights above an architectural grid which makes a dramatic statement. The living room is warmed by an attractive fireplace and the dining room has a door to the spacious view deck. The open floor plan allows the new owner many lifestyle and furniture placement options. Don?t miss the custom designed built in media center hiding the TV and stereo equipment. The main floor master suite with vaulted ceilings has two closets, a jetted tub and a separate shower. 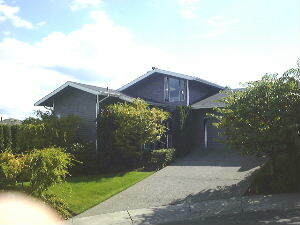 The daylight lower level family room is very large and sports a Lake Washington view and room for your big screen TV. 3 spacious bedrooms share a tiled 3/4 bath. Off the deck is a sunny sport court with basketball hoop.